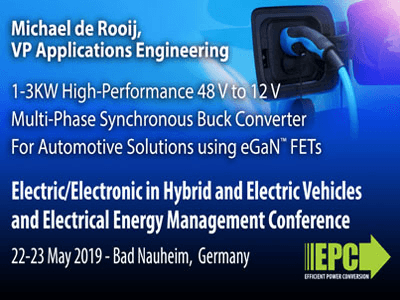 Join EPC at the upcoming PCIM Europe 2019 Conference on May 7 - 9 in Nuremberg where EPC will showcase high power density DC-DC Conversion for computers and cars, as well as Lidar and Class-D audio applications using eGaN FETs and Integrated Circuits. 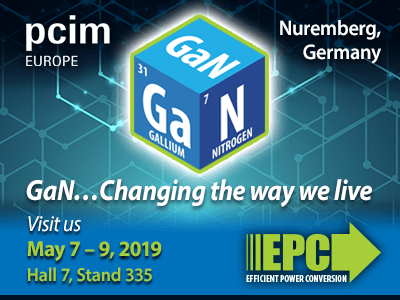 Visit us in Hall #7 at stand #335 for hands-on demonstrations and the opportunity to meet EPC’s applications team – the leading experts in applying GaN technology. The Electric/Electronic in Hybrid and Electric Vehicles and Electrical Energy Management Conference focuses on the topics such as Systems and Architectures for Micro up to Full Hybrid Vehicles, Plug-in-Hybrid and Electric Vehicles and Electrified Powertrain Systems, Electric Charging – Components, Systems and Infrastructure, High Voltage Components incl. Wiring Harnesses and Connectors, and much more.